Plug-in-maker McDSP released a new plug-in pack that allows users to mix and master their recorded music. The vintage Retro Pack is designed to give users the sound of some of the most sought after sounds in audio mixing. The bundle includes the 4020 Retro EQ, the 4030 Retro Compressor and the 4040 Retro Limiter. The Retro Pack is unlike any of the company’s other plug-ins in that it takes a step away from the modern interface in favor of an older look and feel. “The challenge with the Retro Pack was trying not to put too much in there,” Colin McDowell, CEO of McDSP, told Macworld, when discussing the plug-ins new interface. Like older analog gear, the plug-ins don’t have a lot of extra buttons or sliders, but they do give you the vintage sound that many musicians are looking for today. The 4020 Retro EQ is a four-band EQ. The HF and LF bands are shelving EQ, with two additional parametric EQs at the HMF and LMF bands. The 4030 Retro Compressor has a wet/dry mix control to balance compressed and uncompressed signals. 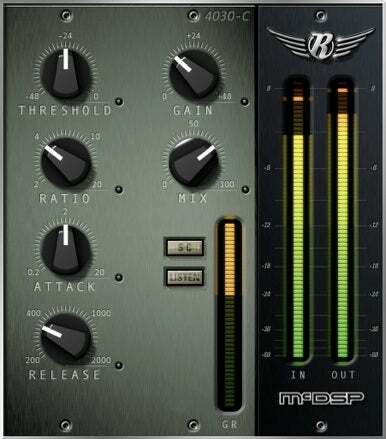 The plug-in also has an active attack and release design that the company says allows for aggressive compression settings with minimal artifact generation. The 4040 Retro Limiter combines a look-ahead brick wall limiter function with some added “treatments” giving it a vintage feel. The Retro Pack will be available in Spring 2009. Made for Pro Tools systems, pricing for the Retro Pack starts at $495; Emerald Pack customers can upgrade starting at $295.